Gain a sneak peak into how our BI solution with predictive analysis works. By combined a number of Google tools, including Google Analytics and Google BigQuery/SQL, the tool gathers all the data marketers need and puts it in one place. In the first post of the series, we look at one of the most important features: goods analysis. One of the major features in the pack is goods analysis (ABC, XYZ, BCG) – optimized prioritization and stocking, insights into average order value and cart contents. That’s where we’ll start the blog series. Let’s see how you can perform product grid analysis and detect overstocks using the BI solution. It goes without saying that slow-moving leftover stock – on the one hand – and overstocking – on the other hand – gravely affect liquid assets and business marginality. As a company running a warehouse, your key objective is to optimize the stock in the most efficient manner possible. That is to attain optimal balance of liquid assets and avoid accumulation of unmarketable goods. By liquid assets, we mean fast-selling goods that generate predictable demand. Our functionality for warehouse and product grid analysis builds on three renowned methods: ABC, XYZ, and BCG. The combination of these three analytical tools enables the marketer to estimate overall product grid liquidity. This information is updated 24/7 for best results. Once the BI is configured, you don’t have to waste time on reporting. 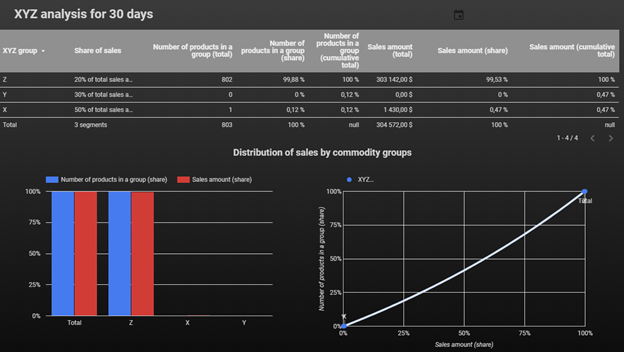 Just open Google Data Studio and get started! How does product grid analysis help your decision-making? You can determine the inventory that needs replenishment as well as unused goods. The latter may be a result of a buyer’s mistake or erroneous sales plan provoking unneeded spend. You can identify the most demanded, fast-selling goods. The shortage of these may translate into lost sales. Then again, it’s your chance to track down and remediate a buyer’s error or inefficient sales tactics. The idea behind АВС refers to Pareto’s law, also known as the 80/20 rule: for many events, roughly 80% of the effects come from 20% of the causes. This method garnered popularity thanks to its universal applicability and practical effectiveness. 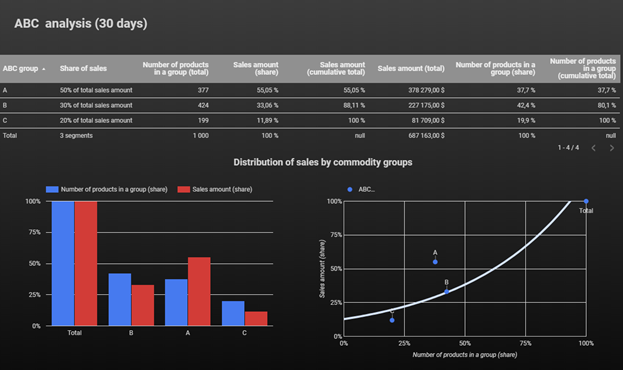 The АВС analysis helps group the goods, or products, based on their overall sales impact (see Pic. 1. ABC analysis). The analytics engine behind our BI automatically calculates all parameters relevant for ABC, steering you away from grunt work and extra reporting workloads. Clear visualization of the metrics helps focus on the big picture. Assigns group categories to the selected goods. The data is updated daily to keep up with evolving trends and save you time for decision-making. Group В – products whose cumulative total makes 50 to 80 percent of the total sales amount. Group С – remaining goods whose cumulative total makes 80 to 100 percent of the total sales amount. That’s one way to look at your product matrix. With these metrics in mind, the system gauges product demand against sales ratio. The XYZ analysis is about grouping items by homogeneous parameters, variability index and demand predictability (see Pic. 2. XYZ analysis). Group X – goods with high predictable demand, best sellers! Group Y – products with medium demand predictability. These goods sell slower. Group Z – products with volatile demand. As a result of this juxtaposition, we are left with 9 groups of products for analysis (see Pic. 3. ABC/XYZ analysis). At that, two criteria apply: impact on the outcome (АВС) and stability/predictability of the result (XYZ). In practice, it just takes a few minutes a day to get a snapshot of your product grid and its impact on sales. This is an indispensable tool for boosting your company’s stock movement. Check out our next blog posting and learn about specific actions to take for each ABC/XYZ combination! This is the best known tool for managing product grids. It’s based on the theory of product lifecycle. Developed in the early 1970’s by Boston Consulting Group, BCG Matrix can be utilized for defining priorities in a company’s stock. The main idea of BCG is as follows: the company benefits when the product has a large market share or the market segment of the product is on the rise. Stars: high growth rate, large market share. These are the best sellers in the company’s business; they are expected to generate major revenues. Cash Cows: low growth rate, high market share. Revenue and cash flow generation are on the high end. Due to the low growth rate, this segment requires only minimal investment. As a rule, Cash Cows once used to be Stars that have eventually outgrown themselves. They are the company’s key asset. Dogs: low growth rate, small market share. Beware of Dogs and keep their number under control. Dogs should fetch cash, otherwise they need to be left out. Difficult Children, or Question Marks: high growth rate, low market share. This segment reveals the worst cash flow parameters. It’s sensitive to funds and shows low ROI due to the small market share. If the share remains unchanged, Question Marks will succumb plenty of funds. What you have to do here is either invest heavily or invest nothing and settle for residual profit. Increase the market share or shell out some extra funds to make this segment work. The bottom line is: ABC, XYZ and BCG are your silver bullets in terms of sales status, margin ratios, stock liquidity, procurement policy, etc. The automatic BI will help you bring those on to the next level and save resources for further business development. That’s it for now. In the next blog posting, we’ll tell you how we apply these analytical tools in practice.